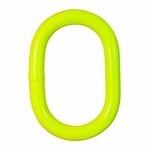 Oblong master links are typically used at the end of rigging assemblies, and most often, they are used on one end only. They are called master links because in a traditional rigging assembly, the master link is on top, connecting directly to the crane hook while the rest of the sling hangs below it. It’s important to note that these master links are made oversized to accommodate large crane hooks and other connection points. Use them with chain slings, wire rope slings and even synthetic web slings. Each link is proof-tested and certified with a 5:1 safety factor.